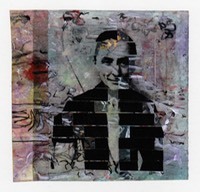 Gail Skudera's painted, woven, drawn, photo-transfer, and collaged works have been exhibited frequently since the early 1980s. She has had solo exhibitions at the Maine Museum of Photographic Arts, Portland; Williams Center Gallery, Lafayette College, Easton, Pennsylvania; Pavel Zoubok Gallery, New York; Saint Mary's College, Indiana; Lancaster Art Museum, Pennsylvania; Contemporary Art Workshop, Chicago; and Sybil Larney Gallery, Chicago, among others. Selected recent group exhibitions include Fem-Portraits at the Rush Philanthropic Art Foundation, Brooklyn (2017); The 2016 CMCA Biennial, Center for Contemporary Art, Rocklnad; The Piano Roll Project: Shared Sensibilities, Bates Mill Complex at Museum L-A, Lewiston, ME (2015); Remix: Selections from the International Collage Center (traveling nationally, 2010-); Image/Clot at Zolla/Lieberman Gallery in Chicago (2012); Sporen, Textiel Festival, Utrecht, the Netherlands (2010); Daughters of the Revolution: Women & Collage, Pavel Zoubok Gallery, New York (2009); 5th International Biennial of Textile Art, Buenos Aires, Argentina (2009); Japanese International Artist's Society Exhibition, Spiral Hall, Tokyo (2009); and Transformation, Pittsburgh Center for the Arts (2009). Skudera received a Visual Artist Fellowship Grant from the National Endowment for the Arts, Washington, DC in 1990-91. She has been the recipient of other grants, awards, and residencies including an Artist Residency, Experimental Printmaking Institute, Lafayette College (2016); Visual Artist Residency, Wilson College, Chambersburg, PA (2009); Robert M. McNamara Foundation Residency Award, Westport Island, ME (2007); New York State Council on the Arts Grant (1998); and Artist in the Arts-in-Education Residency Program, Illinois Arts Council, Chicago, IL (1992-94). Her work is in collections including the International Collage Center, NY and PA; Illinois State Museum; Baird & Warner Corpration, Chicago; Medical College of Virginia; Wilson College, Chambersburg, PA; and the Art Museum of the State University of New York, Potsdam. Skudera is active as a lecturer, juror, university and college art instructor, and was a long-time reviewer for Fiber Arts. Skudera was born in Hackensack, NJ. She studied at Montclair State University, then Northern Illinois University, where she earned her BFA and MFA. She lived and worked in Chicago from 1981-94, northern New York and central Pennsylvania from 1994- 2010. She lives and works in Maine.